Why was this in the Campaign Setting line? In the past, the Campaign Setting line has taken a look at six individual sites - be they castles, cities, or mega dungeons - that could inspire whole campaigns. These products have also expanded on the lore of the Pathfinder Campaign Setting. While Tombs of Golarion accomplishes the latter, it fails pretty terribly at the former. My main complaint is that, although the six tombs were interesting, they felt like set pieces more suited for the Module or Pathfinder Society Scenario line. Of the six selections, only the Prismatic Lantern feels beefy enough to build a greater adventure or even campaign around. The others are too self-contained and stunted to be anything more than throw-away sidequests. Where Tombs does succeed is fleshing out some thus-far neglected regions of Golarion. The Golden Ossuary offers us a glimpse into the wealth-obsessed Kalistocrats of Druma, the Tomb of the Necrophage is a gruesome microcosm of the cannibalistic Koboto people, and the Prismatic Lantern proves once again that we need more information on the nation of Nex. In summary, compared to the possibilities offered by Dungeons or Castles of Golarion, Tombs was a huge disappointment. On the other hand, if you're looking for a few story-rich sidequests with some interesting opponents, you could certainly do worse than this. A thematically diverse set of dungeons. This book is a really a helper when you need some kind of crypt in hurry with a few maps, enemies, and puzzles thrown in. Not big enough to warrant an adventure module on their own, the tombs can easily fit in a sandbox game or an ongoing campaign. Quite like the mini adventures that used to be added to APs back when thy still were made for 3.5E. Ugly maps - not many good monsters. The cover and the interior pictures are great. 3 locations in Avistan are shown on the inside front cover and 3 locations in Garund are shown on the inside back cover. The dungeons are very diverse themed (fey, clockwork creatures, cultists, cannibals, undead). The "animated hoard" is pretty cool. The maps are so simple - i could have drawn them in 5 minutes. Just a few little square rooms connected by a few short rectangular corridors. In the case of the clockwork vault it´s just one big round room. The monsters are very unimaginative - most are just "variant" or "advanced" editions of the base creatures from the bestiaries that differ very little from them, others have a few class levels. What is a really cool concept is ruined by dungeons that are so simple that a 13 year old boy i know could have designed better. Sadly this is the first underwhelming campain setting in years and that in a month when not much else (but the excellent Melee Tactics Toolbox)came out. Thanks, liz. Has it been decided yet whether each of these will be fully mapped? Will this more or less follow the format of Dungeons of Golarion? 6 tombs, 10 pages each? Will there be more fully statted sample levels this time? Only two in Dungeons of Golarion was a bit disappointing. Castles of the Inner Sea included a "level map" for each of the six locations. I wouldn't mind devoting more space to fewer locations, but I suspect that 10 page articles is the sweet spot for their monthly publications. Battle maps will follow suit? I agree. Six places, 10 pages apiece is good. I'm not arguing for increased page count, I'm arguing for different distribution within those 10 pages. This will definitely help with our group's Raiders of Lost Thassilon campaigns. You had me at "catacombs beneath a glorious cathedral." Looking forward to this one. I enjoy the backstory in these kinds of releases. Looks interesting! And great to see that Scott's one of the authors! Getting close to release month any chance of the art being updated soon? Still no final cover and a some products have had to be delayed/moved about is this one of them? The Cairn of Attai Horse-Speaker and the Tomb of the Necrophage sound particularly interesting! 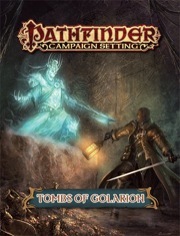 An ancient tomb infested with fey and not undead, awesome!!! The Prismatic Lantern sounds awesome especially if the place's creator is not an undead or evil outsider. 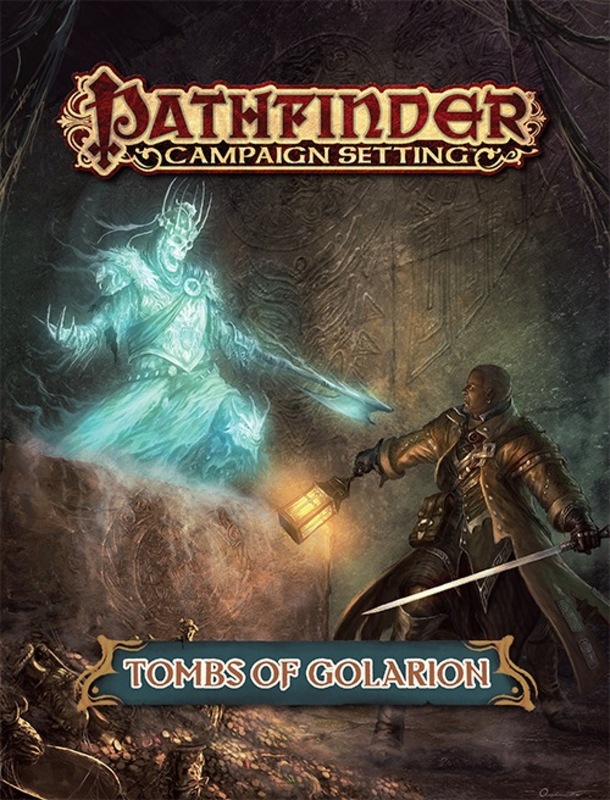 Nice cover art, but I really would have loved to see a demi-lich rising up out of the tomb...you know...because. Looks like the campaign setting line is heading off to some of the most neglected corners of the Inner Sea: Nidal, Rahadoum (Jitska)?, Five Kings Mts?, Druma, Absalom?, Sodden Lands. This is pretty awesome stuff I gotta say. Any good Iconic art in this one? If you got the melee tactics pdf as well, I have a few questions for that in the product thread over there. Amiri fighting an Equine Bone Golem in the Cairn of Attai Horse-Speaker. It's a profile of the scene with her in mid leap about to bring her sword into the huge, equine shaped skeletal creature. Not bad. Zadim fighting several flying clockwork automatons at the Clockwork Vault. He's balanced on a bridge made of slender metal bands and lots of air. Very dynamic and cool! Harsk charging a duergar mounted on a green gigantic spider in Everforge. We're off to his right an lower looking towards the duergar he is charging who is also moving quickly into battle. Seoni blasting a calikang in the Golden Ossuary. She's crouching and holding out her hand while the six armed thing looks as though it's about to either grab her or split he in two. Sajan dodging a green/yellow energy beam from the Prismatic Orrery in the Prismatic Lantern. Pretty straight forward image, but being attacked by an orrery is definitely different. Seelah is fighting waist deep in foul water against gruesome looking mudlords (they may be juju zombie brutes, but mudlord fits the overall image and location better) in the Tomb of the Necrophage. There is light coming through from a grated portal behind her and the mudlords have an almost undead appearance (hence my hedging to the juju zombies) to them that is really creepy. So what are the creatures found in the fey infested Cairn of Attai Horse-Speaker? A wight barbarian. That's definitely different. What's the difficulty of the tombs in general? Cairn of Attai Horse-Speaker—CR 9 approx. Tomb of the Necrophage—CR 5 approx. Ahh ok. I wonder how inspired this stuff was by reactions from that Medusa Tomb adventure in Taldor. I ran my group through Tomb of the Iron Medusa as part of the campaign we were in right before our current one. It was fantastic! Great story and some deep role-playing opportunities were available. None of these tombs feel like that one; they seem more built around the classic concept of a tomb dungeon than anything else. They have always been a popular trope of the game, so I doubt the response to Iron Tomb was responsible for this book. Are the tombs mapped? I might pick this up just for the giant siege engine tomb. That sounds like something my players will love. Each tomb is a complete small dungeon with map, encounters, the works. Just checking, do you mean like, each dungeon has rooms like N1-N8 and each room has a description, monsters and treasure listed? It certainly does.... It's six flavourful, mapped, described and fully fleshed out tombs - complete with suggested plot hooks - add to that some well developed NPC protagonists and new creatures - I'm already planning on how I might insert some of these into my ongoing campaigns... And if I don't do that, I'm definitely going to run a series of Aspis Consortium funded tomb raids!!! The format is a little different to a module or adventure path, but there are room numbers, descriptions, monsters and traps. There's not much treasure listed, though, other than a few specific items for flavour. I guess they leave the mundane treasure up to the GMs. This sounds awesome. A bunch of ready-to-use mini-dungeons are perfect for me. I was way disappointed with Dungeons of Golarion only having two fully statted dungeons, so this sounds much better in comparison. The lack of treasure is even good for me, since I like to tailor to my PCs. Did you just cast animate objects? Because money is flying out my wallet. I have death attack (wallet) and favored enemy (gaming budget) as class abilities. The description of Anuriel Malaseer on page 42 lists "Advanced Bestiary 199" as a reference. What product is this, and is that where the 'platinum-clad' type comes from? The Advanced Bestiary is a 3rd party product that was updated to pathfinder by Green Ronin Publishing. It's actually a book of 100+ templates. The Advanced Bestiary is a 3rd party product that was updated to pathfinder by Green Ronin Publishing. It's actually a book of solid gold, 100% FDA approved pure awesomeness. Really cool and evocative stuff. Kudos!